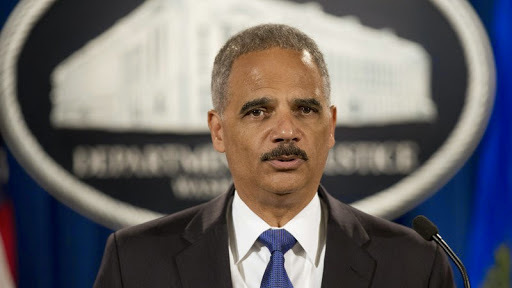 Eric Holder Jr., the nation's first black U.S. attorney general, will resign his post after a tumultuous tenure marked by civil rights advances, national security threats, reforms to the criminal justice system and 5 1/2 years of fights with Republicans in Congress. President Obama said on Thursday that Holder, 63, intends to leave the Justice Department as soon as his successor is confirmed, a process that could run through 2014 and even into next year. A former U.S. government official says Holder has been increasingly "adamant" about his desire to leave soon. Holder and President Obama discussed his departure several times and finalized things in a long meeting over Labor Day weekend at the White House. Holder already is one of the longest-serving members of the Obama Cabinet and currently ranks as the fourth-longest tenured AG in history. Hundreds of employees waited in lines, stacked three rows deep, in early February 2009 to witness his return to the Justice Department, where he previously worked as a young corruption prosecutor and as deputy attorney general - the second in command - during the Clinton administration. Another huge controversy - over his decision to try the Sept. 11 plotters in a New York courthouse in the shadow of the twin towers of the World Trade Center - prompted venomous reaction from lawmakers, New York City officials and some victims' families. Under pressure that threatened his job and his legacy, the attorney general reversed his decision and instead sent the cases to military court - where they continue to languish even as Osama bin Laden's son-in-law and other terrorism defendants are serving life sentences in maximum-security prisons on American soil. The attorney general's portfolio, which spans sensitive law enforcement cases and hot-button social issues including marijuana and gay marriage, didn't help. But even longtime aides say Holder didn't do enough to help himself by shrugging off preparations and moot sessions before congressional appearances and speaking off the cuff - and obliquely. In the end, the decision to leave was Holder's alone - two sources told NPR that the White House would have been happy to have him stay a full eight years and to avoid what could be a contentious nomination fight for his successor. The attorney general told DOJ staff the news this morning and called civil rights icon Rep. John Lewis, D-Ga., and Ethel Kennedy, the widow of former AG Robert F. Kennedy. The sources say a leading candidate for the job is Solicitor General Don Verrilli, the administration's top representative to the Supreme Court and a lawyer whose judgment and discretion are prized in both DOJ and the White House. For instance, Holder sent a memo to U.S. attorneys Wednesday urging them not to use sentencing enhancements known as "851" tools to gain leverage in plea negotiations with defendants - in essence, threatening defendants into avoiding trial with huge amounts of prison time. The practice has been criticized by U.S. District Judge John Gleeson in Brooklyn and other jurists. Long-awaited racial profiling guidelines for federal agents will be released soon, too. Those guidelines will make clear that sexual orientation, ethnicity and religion are not legitimate bases for law enforcement suspicion, but controversial mapping of certain communities - including Muslim Americans - would still be allowed for national security investigations, one of the sources said.